Save Our Spit, a Gaven by-election Issue. Candidates for the Gaven by-election will be asked by the Save Our Spit Alliance (SOSA) for their views on the community efforts to stop the development of the shipping terminal for the Spit. - The precedent of giving public open space to private developers, as is proposed on The Spit, which could happen anywhere in the city. - Potential flooding of Gaven homes on the Nerang and Coomera Rivers from the change to the Seaway from massive dredging. - Loss of recreational opportunities for the people of Gaven who use The Spit and Broadwater for swimming, sailing, fishing, picnicking, and walking pets. - Severe damage to the best coastal surf break on Straddie as a result of the dredging. - Loss of income to local businesses dependent on access to the Broadwater. - Dredging costs of at least $5 million per year to taxpayers." "We intend to take this issue to the Government at every opportunity and the Gaven by-election is a fore- taste of direction of our campaign at the full election in 2007, if the Government hasn't heeded the community call for 'No shipping terminal' before then." "Voters in the electorate will be asked to only vote for candidates who support the Save Our Spit campaign for 'no development north of Seaworld Nara'. The candidates responses to the five questions developed by SOSA can guide voters in their decision"
2. What is your personal, or party, view on taking action to ensure the permanent protection of public open space on the Gold Coast, particularly The Spit public open spaces? 3. a. What are your, or your party's, views of the development of a superyacht marina facility in the public open space of the Marine Stadium? 4. 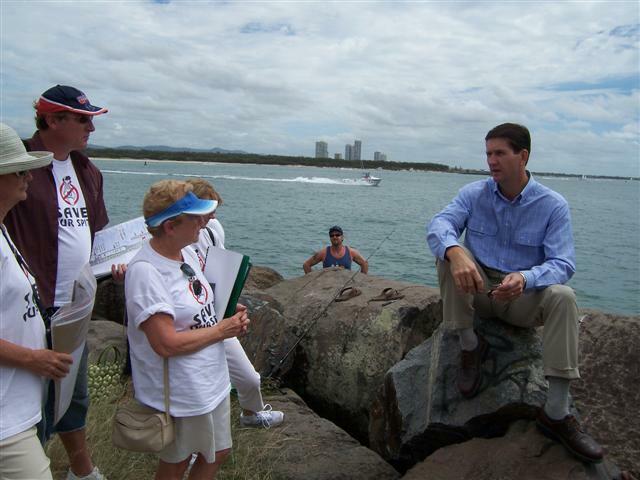 How will you, or your party, protect residents who may be at risk of flood and erosion damage of the Nerang and Coomera Rivers, as a result of the dredging of the Seaway for the shipping terminal? 5. The Spit public open space, north of Seaworld Nara has been neglected by governments for many years and does not present an attractive view to visitors and residents. How would you address this issue? Rita Mahon, Nerang Community Association, 0407 021 012. Lois Levy, Gecko-Gold Coast & Hinterland Environment Council, 0412 724 222.